I received a ticket on Sunday May 22 for speeding on Hwy 401 WB in the Lakeshore area near Windsor. I was going downhill and the OPP officer clocked me at 134 km/h using LiDAR from the right shoulder while I was driving on the left lane. He must have clocked me at some distance because I slowed down (which he admitted) well before I crossed his unmarked white vehicle. I didn't feel like I was driving that fast because I was using cruise control between 120 to 125 the whole way during my trip from Toronto to Windsor. There was also a 18-wheeler on the right lane that obstructed his view to my car starting at 100-200 meters behind where he was parked to about the same distance in front. I doubt this could be used to argue however. He dropped the speed to 129 km/hr and gave me 3 demerit points and $138 fine. I am worried about my insurance rates. I am from Toronto and the court specified in the ticket is in Windsor. I am thinking that I will try the early resolution with the prosecutor over the phone to hopefully get rid of the points. Can I request full disclosure prior to meeting with the prosecutor? Could the prosecutor do anything in this case when I meet him? I am also contemplating using a paralegal from Windsor. If I fail to reach an agreement with the prosecutor over the phone and request trial, can the paralegal meet the prosecutor again prior to the trial? Can I request full disclosure by mail? Another question: What regulation governs LIDAR? 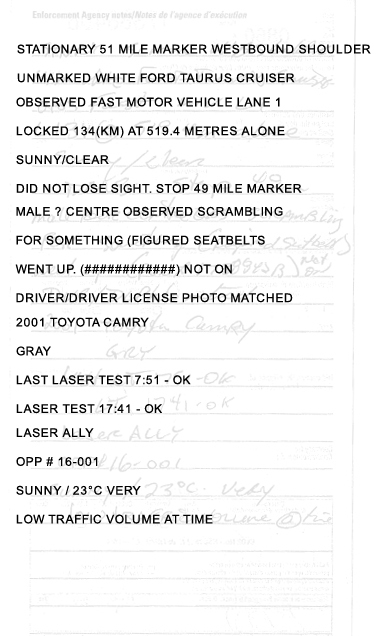 Is it PART XIV.1 (section 205.1 to 205.14) of the Highway Traffic Act which references "PHOTO-RADAR SYSTEM EVIDENCE"? If so, is there photo evidence of LIDAR readings? If not, how can the officer's word be used as evidence in court? If I am interpreting the clause below, the officer who operated the radar system as evidence against the defendant (me) if I am challenging that evidence (i.e. reading)? 205.10 (1) The certified statements in a certificate of offence are admissible in evidence as proof, in the absence of evidence to the contrary, of the facts stated in it. 1993, c. 31, s. 2 (9). Sorry for this loaded post, any advice would be much appreciated. Any advice? Does seeking an early resolution by phone hurt my chances for a favourable result at the end? When should I request for disclosure? There's a lot of questions here so i'll just fire off some answer really quickly to get you going in the meantime. - If you're worried about your insurance rates, demerit points are useless. Insurance providers don't use demerit points, the ministry does. Instead of assessing points, your provider puts offenses into 3 categories (minor, major, serious). Speeding 1-49km is going to be minor whether it's 5km or 25km. - When you request disclosure, they just have to make it available to you. There's no requirement that they send it by mail. They may just tell you to pick it up. That's something you might want to discuss with them. Since you're a couple hours away, they might arrange something a bit more convenient for you. - Speeding is an absolute liability offense. That means you were either speeding or you weren't. Having the cruise control set at 120km means you're guilty. - During early resolution they will offer you a plea deal. To them, you either take it or don't. If not, they will get you set for a trial some time down the road. Once you know your date, you can request disclosure. You'll be offered pretty much the same deal once again during your trial date. - Seeking early resolution has no impact whatsoever on a future trial. I was inquiring about requesting full disclosure to the court and they forwarded me to Windsor Police Services. Talking to Windsor Police Services, they said I cannot request full disclosure by myself - only a lawyer can request it on my behalf. The only other option is to go through freedom of information to request it, but it seems as though they collect a fee for it. I don't think the Windsor Police Services would be able to disclose anyways because it was a OPP officer that handed me the ticket not Windsor Police Officer. So I called the OPP Essex detachment and they said the only way I can request full disclosure is through freedom of information. How should I request full disclosure? Your request for disclosure gets sent to the Prosecutor at the Prosecutors office. It does not get sent to the police and does not get sent to the clerk of the court. First you plead NOT GUILTY and request a trial with the officer present. Then you wait until you receive your Notice of Trial with your Trial date. Once you get this, then you send in your disclosure request (by fax or by mail) to the prosecutors office. Exactly that. You don't pay for disclosure, it's required. But the police give it to the Crown and the Crown discloses it - not the court and not the police. You got a rookie court clerk it would seem. I received the officer's note from the disclosure request via email. I had requested much more than the officer's request, but all I got was this. Any comments or advice. I can hardly make out most of it except that the unit was tested before and after the reading. The trial date is set for August 24th. Do I have any shot at making case against the offence? I would send another request asking for everything again that you did not receive. And definitely include a request for a typed copy of the officers notes as it is very hard to read and also ask for an explanation of all short hands used. I really can't make out most of it, so can not comment on how I would defend it. If the officer only provided this one page in disclosure, then this is the ONLY note they can read from when on the witness stand. I am assuming that the officer has a note book with more details than what are on this supplied note, and that there is hopefully something important missing from this note that would be in his other notes. Why is this important? Because, when the officer first takes the witness stand, the prosecutor will ask him a few questions about his notes (when did you make them?, are they in your hand own writing?, what purpose do you need them for?). The officer should answer that they were made shortly after the incident, that yes they are in their own hand writing, and that they need them to refresh their memory of the events. You should then be asked by the Justice of the Peace if you have any questions about the notes. My first question would be "Can you show me all the notes you have with you that you are needing to refer to?" If the officer showed me more than that one note that was supplied in disclosure, then I would say "I only received this one page note in disclosure, so I object to the use of all the other notes the officer is refering to, except the one that I received." So if the JP agrees and the officer is only allowed to use the one note that was provided to you, you then need to be listening to every answer the officer gives to see if it is from the note you got in disclosure or not. If the officer gives an answer, but the information is not in the note you have, you could then ask "I notice that the information you just gave, is not on this note that I was provided in disclosure. Where are getting this information from?" You then want them to say something like "it was in my other notes" and then you can object and ask for the information that the officer gave to be excluded from evidence because it was from the notes that he was not allowed to use. Also, what is it that you're missing that you need to make another disclosure request? I don't think I will get anything more of value that will help the case. The prosecutor had offered 2 points instead of 3 in the early resolution. Half of these aren't applicable or will not even exist. I can tell you've used someones bad template to send off your disclosure. You want to refrain from sending all these requests because I can almost guarantee you'd never know how to explain in court why you need half of these. They can and will counter any disclosure arguments with your laundry list of demands. You're usually never going to get typed notes the first time around. Legible is up to the individual reading it. You can't decide what is or isn't legible before you are presented with the notes. You can certainly make a second request though. Anything regarding the device used is made clear in the notes and you're not going to get much more than what you've received (other than the testing pages out of the manual). You have the device used, the manner in which it was used, locked distance and speed, and the times before and after when the unit was tested. You're not going to get both sides of the ticket. You have the ticket. Unless there's notes on the other side, if there even is another side, then it would be provided. You're not going to get the full manual. They'll provide you with the couple of pages detailing the testing procedures and that's about it. If you make it an issue, they'll adjourn your trial and they'll have you set up a date with the prosecutors office where you can show up and go through the entire manual. Witness statements, defendant statements.... they don't exist. There aren't any witnesses and if there were, you certainly don't get their address, occupation, and criminal record. It's an outrageous request. If you want to make a second request for clarification of the notes or even the testing pages out of the manual, you can do that. I would recommend you disregard any recommendation that you send out this laundry list to the prosecutor again. If you're going to make a request, be prepared to explain why it should be provided. They might just ask you explain every request if you walk into court and argue you haven't been provided with full disclosure. Based on you described, I don't see any point of requesting disclosure again. The manual is the only thing they would be required to provide and the testing procedure for this LiDAR is quite straight forward. I will take the offer from the prosecutor for 2 points and the fine.